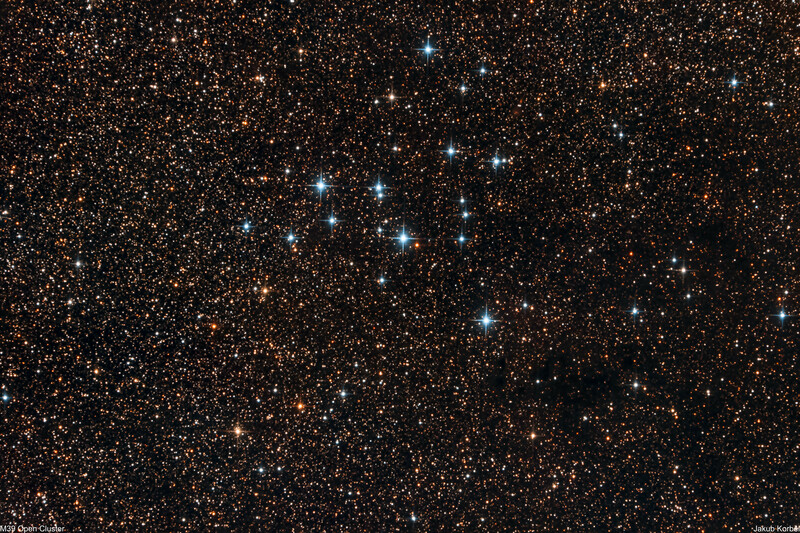 Messier 39 is an open cluster located in constellation Cygnus and it’s only 825 light-year away from Eartch. The cluster is visually located on the galactic plane of the Milky Way, therefore there are so many stars in the background. I already captured M39 two years ago, but with different camera and different coma corrector. This time I used slightly bigger sensor and brand new corrector TS MaxField. This corrector should reduce the focal length by 5% and also due to the larger sensor I got bigger field of view compared to my previous picture. However, the corrector is not capable of eliminate the coma fully and in the corners are the stars elongated. I spent some time by adjusting the tilt, but this obviously didn’t solve the problem. This means that the only corrector which is capable of eliminating the comatic aberration fully is Explore Scientific HR CC. 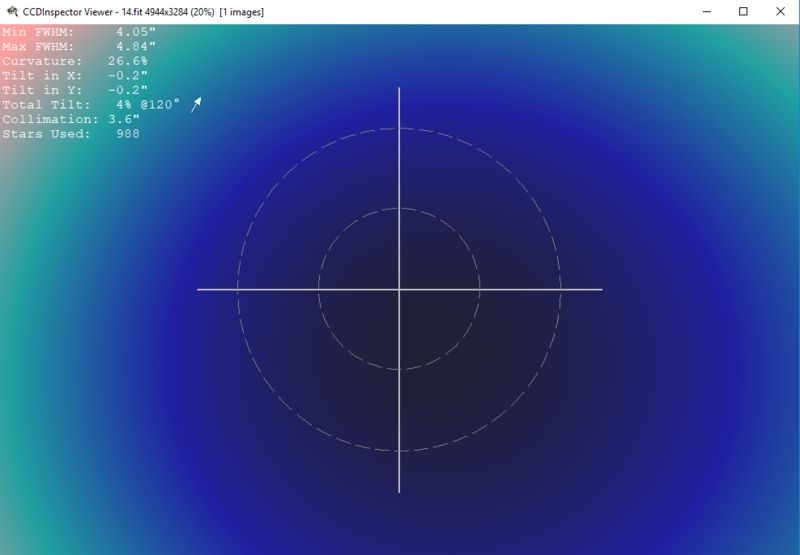 Here is the analysis of the curvature by CCD Inspector. I already adjusted the tilt by integrated push-pull screws on ASI071, but there is still some room for improvements. 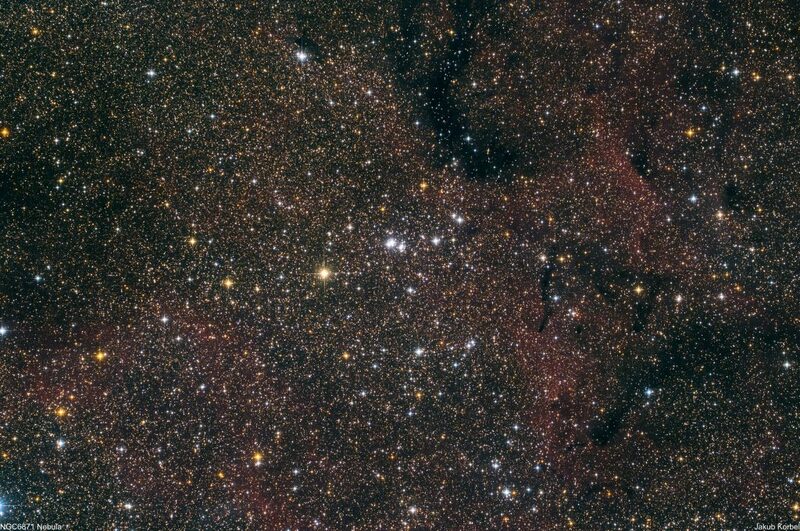 NGC6871 is an open cluster located in Cygnus, has less than 50 stars and it is 5135 light-years from Earth. Constellation Cygnus is visually located on the galactic disk of the Milky Way; therefore there are many stars in the background. Particularly interesting are the dark nebulae, surrounding the cluster. Picture was taken under dark skies of Milos Island and in total, it’s an integration of on 63 minutes. 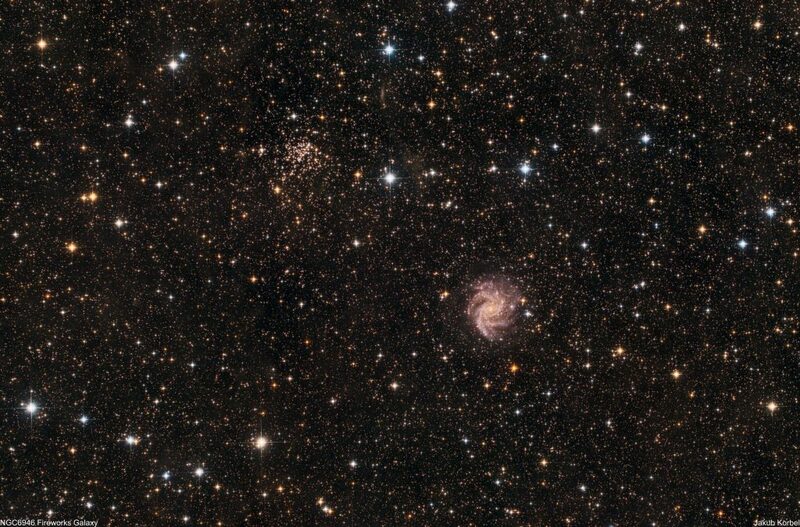 NGC 6946, sometimes called Fireworks Galaxy, is a beautiful spiral galaxy located between constellations Cepheus and Cygnus. It is approximately 22.5 million light-years away from Earth and it’s a part of Virgo Supercluster of galaxies. The name didn’t get from the shape, but due to frequent explosions of supernovae. Next to the galaxy is located NGC6939 Ghost Bush Cluster, which is a part of our own Galaxy, therefore the distance from earth is “only” 4000 light-years. The picture is the last one from the day. I slewed to target, switched on auto guiding and went to sleep. Therefore the picture is an integration of 73 photos, each 5 minutes long, i.e. 6 hours of total time. This is probably the picture with the longest integration time from Milos. North America nebula, also called NGC 7000, is a giant cloud of ionize hydrogen gas – HII region, located in constellation Cygnus. The shape reminds contour of the North America continent, specifically the eastern cost between Golf of Mexico and Florida. 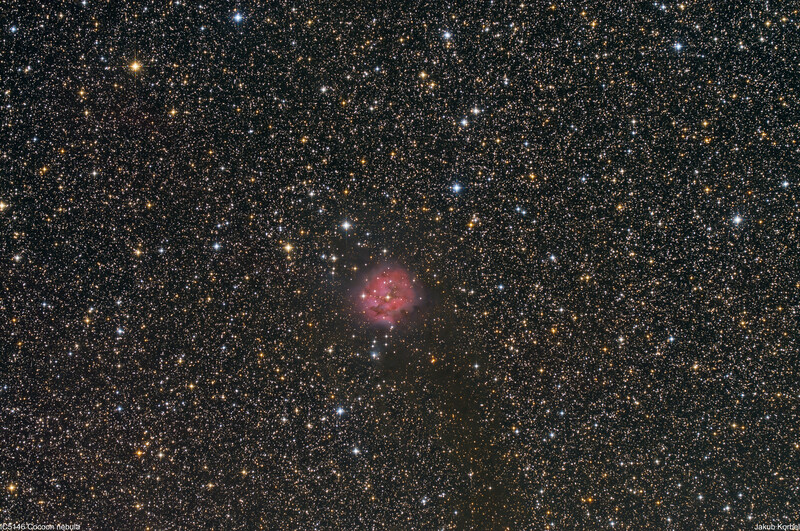 Visually, the nebula is big and it didn’t fit in my telescope/camera field of view. 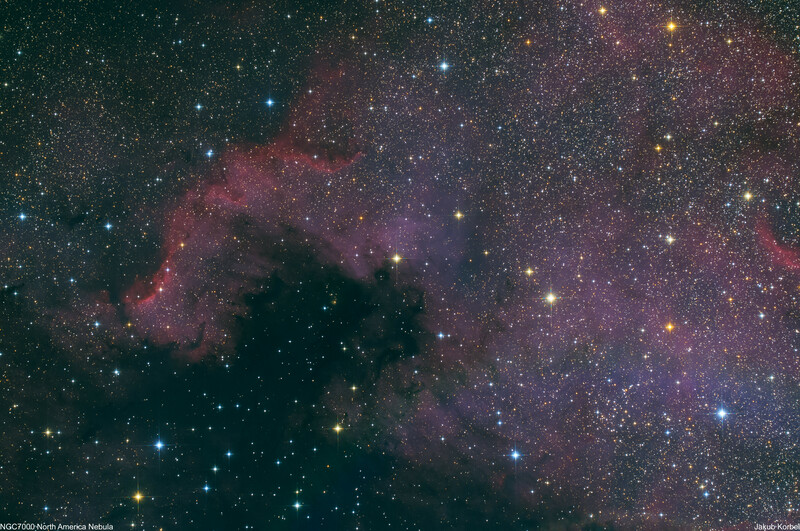 NGC 7000 together with Pelican nebula create a nebulae pair, which is approximately 2000 light-years from Earth. The picture demonstrates how low light pollution on Milos Island is. The picture is an integration of only 27 pictures, exposure 3 minute each, i.e. 81 minutes in total. It’s impressive – no narrow band filters were used. Crescent Nebula, also known as NGC 6888, is a HII region, hot ionized hydrogen gas cloud. The nebula got the shape by high speed stellar wind of Wolf-Rayet star, which is colliding with slow moving mass, ejected by this star during transformation into a red giant. The nebula is approximately 5000 light-years away from us and it can be located in constellation Cygnus. The picture is the last one from 6.9.2018. In the evening I captured Omega nebula, M80. 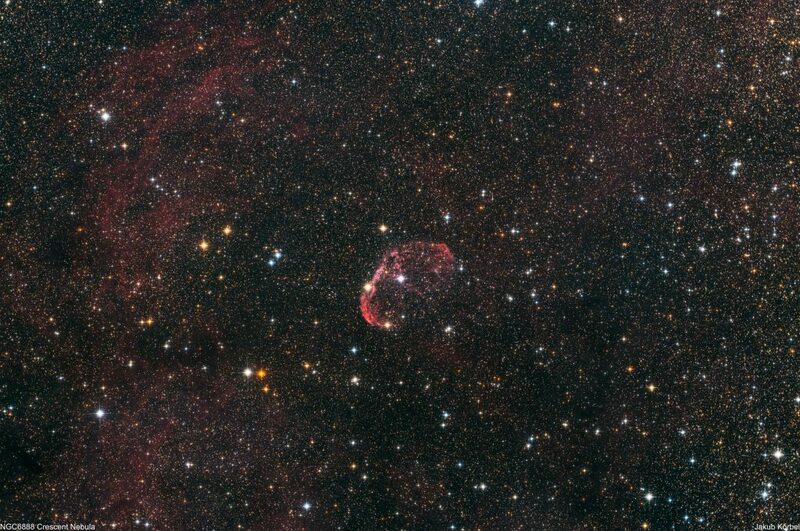 As a last deep space object I pointed on Crescent Nebula, started auto guiding and went to sleep. Therefore the picture is a stack of 64 pictures; each has 3 minutes of exposure time, thus total integration time 192 minutes.